This is a post-trip blog on my recent visit to Hong Kong with Warden, which was just for five days from the 12th Sep to 16th Sep. Coincidentally, we found out just about a week before the trip that one of Warden’s friends will be traveling there with his girlfriend as well, which was from 11th to 15th! How about that? It so happened as well that in the week of 7th to 11th, I was supposed to work the night shift. Just as well. On the night of the 11th Sep, I was frantically trying to clear up the work, and whipping my team to hurry up. Unfortunately, I was in office up til 3:45am and I just barely had time to rush home, grab a quick shower and off we went to the airport. At least the 6am flight did not leave without us! Immediately after the flight took off, both Warden and I were dead to the world, and I hardly remembered much of the forgettable Jetstar flight from Singapore to Hong Kong. The Airport Express train from the Airport to my sister’s place in Tsing Yi took like 15 mins and we were soon depositing our stuff on the floor of her tiny apartment. Needless to say, I was very impressed with the comfortable train ride. The next moment, Warden received a SMS from her friend, who wanted to go to the Peak that evening. That was not really in the plans, but on hindsight, it was a stroke of luck that we went there when we did, as you will see why later. Warden and I walked one of the trails of the Peak, which took us about an hour. It was hot, humid and we really should have turned back once I had taken a few shots of the view, the second half of the trail was not that exciting for us. On Sunday, the second day of our trip, we went to have a look at the famous gigantic Buddha perched on a hilltop. It was hot and humid again, and worse still, the haze was pretty bad. Nevertheless, we managed to climb the steps to the top and had a view of the surrounding area. The day after, Monday, was where things got interesting. Firstly, it felt good that while Warden and I were in our casuals, the throngs of people boarding the MTR were in their work clothes in the morning. 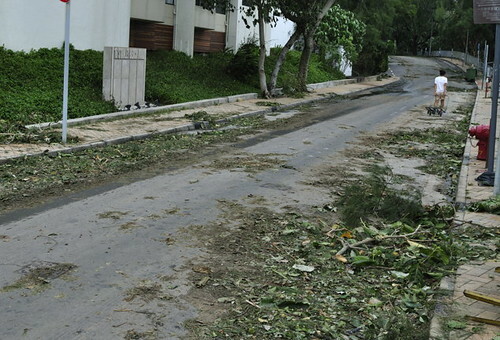 We also had news that Typhoon Kuppo had reached the shores of Hong Kong and had hit level 3. As we were headed for Macau, my brother-in-law advised us to get back around 5pm in the evening, in case the typhoon level goes up. Good advice, it turned out. 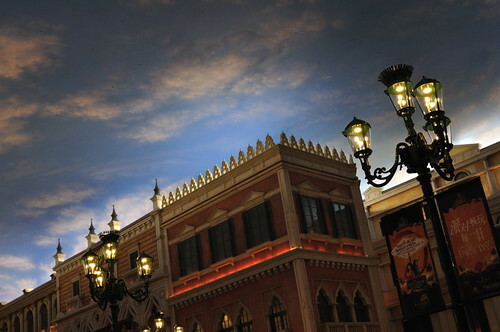 Macau is well-known as a gambler’s paradise, as much as it is known as a World Heritage site. Its famous almond biscuits are also much sought-after by tourists, to be brought back home as souvenirs and gifts. We were told that a visit to the Venetian will be worthwhile, and true enough, for a first-timer, I was awed by the interior decorations and the entertainment held within. As it was pouring cats and dogs outside, we were much grateful that the indoors gave us some respite from the bad weather. 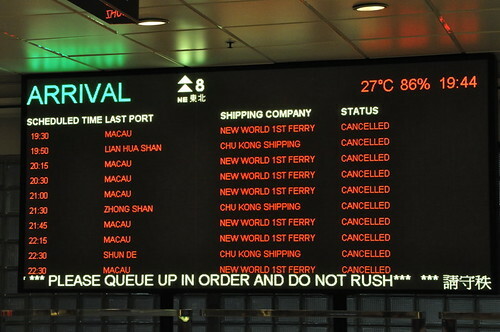 After the Venetian, it was 6pm when we reached the Macau Ferry Terminal. When the ferry left the shores and headed back for Hong Kong, it was still typhoon #3. Yet, five minutes later, it was announced that typhoon signal 8 had been declared, and that our trip may take longer than usual. Warden turned to me and asked if it was safe, and I replied “Yes” without giving it much thought. What else can I say right? 😀 So Warden went back to sleep, while some of the people around us started throwing up about halfway through the journey. When we finally reached the Hong Kong Kowloon Ferry Terminal, where our friends were waiting for us to deliver the Macau almond biscuits, we discovered that we had taken the last ferry out of Macau! OMG, were we lucky or what?! Luckily for us, the typhoon’s fury simmered down the next morning. We spent the rest of the time visiting Stanley Market, and saw what appeared to be the aftermath of the typhoon. Warden got her chance to spend more time to shop, and shop, and shop… and we visited the Avenue of Stars on the last day, before more last minute shopping. There was minor panic when we were coming back at the Hong Kong Airport. For some strange reasons, Jetstar did not indicate which Terminal we were supposed to go to, so we took our chances and headed for Terminal One. Unfortunately, we had to check in at Terminal 2! Pffffttttt… so off we rushed to get our tickets, then grabbed a quick dinner from Burger King (which costs quite a bit more than in Singapore), then headed for the Gate. It seems like Terminal 2 in Hong Kong is unlike Singapore’s where no flights actually take off from there! It was simply check-in counters, shops and food, then after going through the gates, we were transported via bus to the plane. So travelers on the way out of Hong Kong beware, do not get caught like we almost did! Wow, strange orange lighting on the first photo. I like! The 2nd photo a bit strange! That darkness engulfing part of the sky in some strange shape. Very strange! Lol Wilfrid, the second photo is actually the artificial sky of the ceiling of the Venetian Hotel. It was very impressive when I first entered the place. The interior is almost like a Virtual Reality thing on the Starship Enterprise (of Star Trek). You see the tiny black dots in the skies? Those are not flies or camera noise, I suspect they provide the lighting effect. We went Macau and HK in May. Miss the food now. Gosh .. got typhoon! Luckily it didn’t really affect your trip!